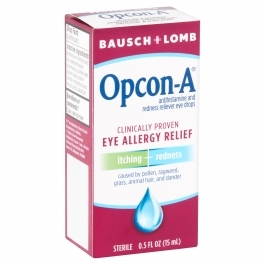 Opcon-A® Antihistamine and Redness Reliever Eye Drops combine an antihistamine for itch relief with a redness reliever. Available without a prescription, Opcon-A® eye drops temporarily relieve the itching and redness caused by pollen, ragweed, grass, animal hair, and dander. They can be used up to four times a day. Place 1 or 2 drops in the affected eye(s) up to 4 times daily. Active Ingredients - Purpose Naphazoline HCI (0.02675%) - Redness reliever Pheniramine maleate (0.315%) - Antihistamine Benzalkonium chloride (0.01%), boric acid, edetate disodium (0.1%), hypromellose, purified water, sodium borate, sodium chloride.